This month’s round up comes to you with a new added source of material, Twitter. 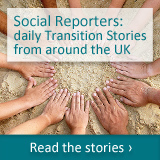 There are hundreds of Transition initiatives on Twitter, and they offer a more intimate insight into what’s happening on the ground, stories that wouldn’t necessarily warrant a blog or make the local press, but which offer a great sense of what people are doing. Hopefully you’ll agree that this month’s round up is all the richer for it. Feels to me like the fullest and most vibrant we’ve yet produced. Let’s start in the UK, and head to St Albans. 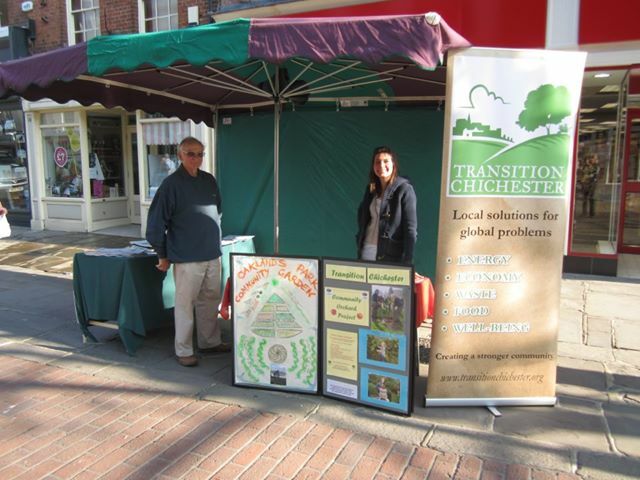 You can catch up on the latest news from Transition St Albans here. One of their key activities has been the rolling out of Transition Streets, which is already being done by 40 households in 6 groups, with another 7 groups forming over the summer. Transition Wilmslow recently organised a work party to build raised beds at the Riverside Hotel in Colshaw. Sunrise and £B have teamed up to make the Bristol Pound the currency for this year’s main festival. 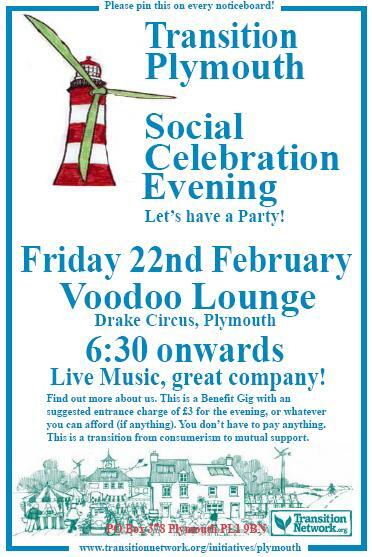 We feel it is a fantastic opportunity to spread the word of the £B as a catalytic tool for positive change. 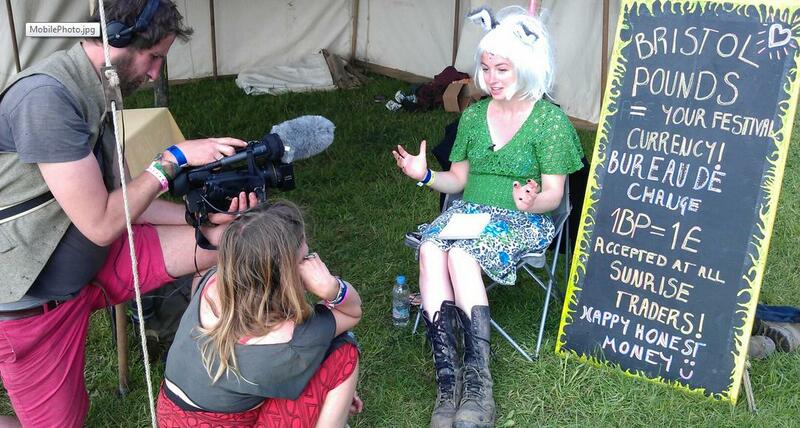 It adds another great element to the festival, an interesting and fun way to get people thinking about money and to experience the enjoyment of using a community owned currency. 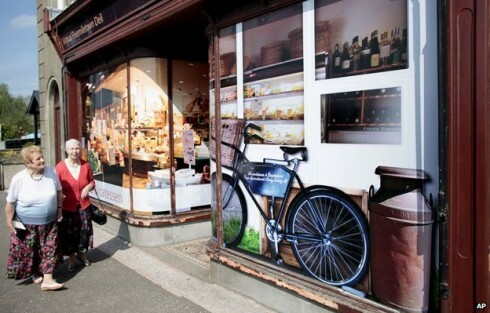 Transition Belper continues to grow and break new milestones all the time. This week we will see the number of supporters for the group going above the 500 level, something the 5 guys who sat together in December 2009 and said ‘should we get involved in this new Transition movement’ should be very proud of. From a practical point of view work continues on the green spaces of the Belper Train Station, adopted in April 2012, we have just held the first Youth Market in Derbyshire, we have seen the launch of Totally Locally Belper and this weekend sees the first Eco festival to be held in Belper, all organised by Transition Belper. 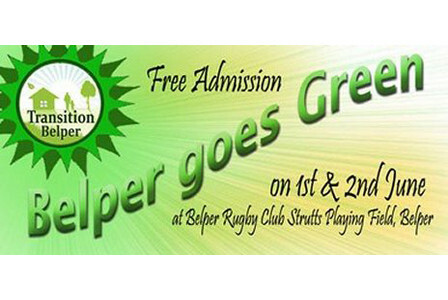 The above-mentioned ‘Eco festival’ was actually called Belper Goes Green, and was their first ‘Transition Festival’. At the end of the day they tweeted, “what an amazing effort, we are unleashed”. Transition Town Stratford’s GardenShare scheme is going well, they recently tweeted “folk are busy harvesting delicious new potatoes and giant radishes”. Now the council hopes to team up with a Bath-based renewable energy company to achieve the ultimate goal – a dramatic reduction in energy consumption and as much home-grown energy from renewables as Frome uses. Our prayer for Transition is to let us move forward with pace and a balance of hands, head and heart in all that we do, so that we stay connected to ourselves and others as well as the planet we live on. And always bring tea and cake. Transition Reading now have a new Steering group in place. 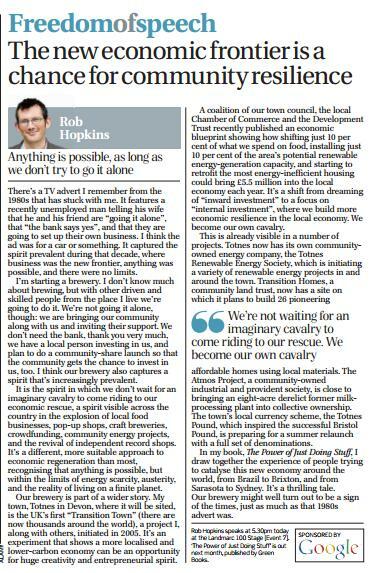 Transition Social Reporter Kerry Lane wrote a great piece sharing a vision for resuse and repair in Shrewsbury. Transition Sheffield ran an event to bring together Transition groups in and around the city to share their ‘Local Transition Stories‘. Another excellent, in depth article about what Transition looks like in practice in a particular place was this article about Plymouth in Devon and what’s unfolding there Transition-wise. TT-Forres in Scotland welcomes 16 Scandinavian visitors. Read more in the Forres Gazette. TT-Marlow (Bucks) have set up a new monthly market in which anyone can set up a stall as long as they are selling locally made produce or are offering a local service. 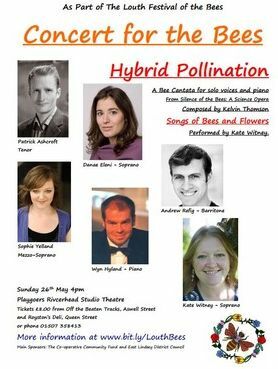 Transition Louth recently held ‘The Festival of the Bee’, which included a wealth of bee-related events, including the Louth Concert for Bees (see poster, right). It inspired the local paper to a cascade of dreadful bee-related puns, such as “Louth is soon to become a hive of activity as the town prepares to celebrate its first ever Festival of the Bee organised by Transition Town Louth and Louth in Bloom”, and talk of “making a beeline” to the event and how it was “buzzing”. TT Honiton in Devon have created a new waste group and have also been busy with a clothes swap. From TT Lewes, some growing tips for the forthcoming month of June. TT Romsey teamed up with Riverford Organic Farm to organise a poetry competition for primary school children on the theme of growing your own. You can read the winning poem and some other entries here. There must be hundreds of fruit trees in Cambridge gardens producing unwanted or wasted fruit. 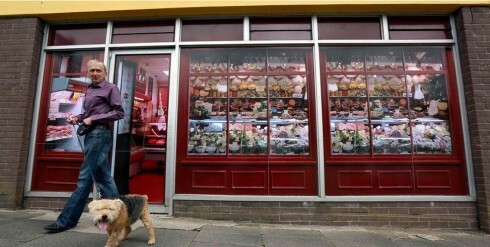 The Food Group are planning a new project to tackle this situation. Do you have a fruit picker or a lightweight (bike friendly) ladder that you’d be willing to lend to the project? Do you have a garden producing too many apples, plums or pears for your needs? Would you like to join the harvesting teams? As new initiatives go, I think Transition Garstang is a fantastic example. It has made a space for itself in a place where there is already plenty going on and you could feel daunted by that alone. It has partenered up and gained acceptance from all manner of local groups and has been willing to try things and take the risk of failure. The future is full of new ideas and opportunities. All I can say is thanks for giving me the time to learn so much about you. Go Garstang! To London now, and news of some of the groups there. A couple of them have recently been celebrating the anniversaries of their setting up. Transition Town Tooting just turned 5! Here’s a great blog by a newcomer to the group, reflecting on the party, on feeling part of the project, and, of course, on the cakes that were made for the event (see below). 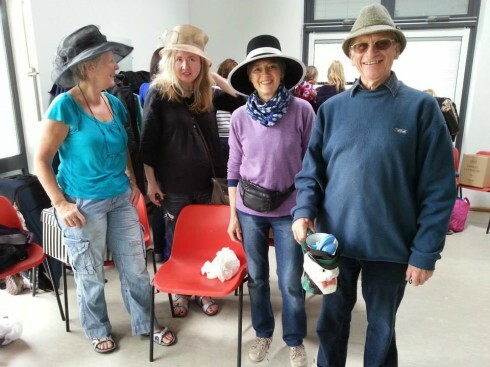 Transition Town Kingston (you can read their latest newsletter here) held their 5th birthday party, which included an entertainer which they described on Twitter as being “a zany performer described as a cross between Brian Cox, Harry Hill and Lady Gaga”. Blimey. Marilyn Mason, a key member of TT-Kingston, and not ”a zany performer described as a cross between Brian Cox, Harry Hill and Lady Gaga” has been praised for her work in the local community and nominated as an unsung hero. 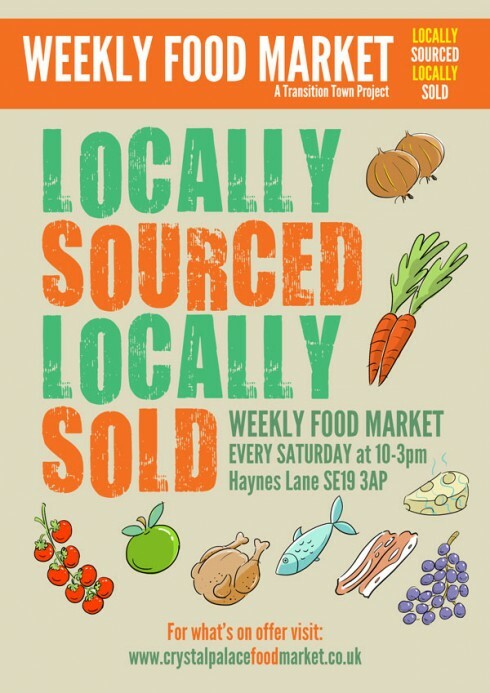 The day after their AGM, CPTT launched the Crystal Palace Food Market, which has been a huge success. The Crystal Palace Transition Town group got this market off the ground in less than a year. They did this without a six-figure grant from the government. They did so without needing any endorsement or assistance from a television celebrity.The market has been an immediate draw for local families. It was achieved through the hard efforts of unpaid volunteers and by spreading “word of mouth” digitally, online, via Twitter and Facebook, with some outlay on acquiring stalls and some printing and associated costs. So many people attended the market on its first staging a week ago, that many of the traders were almost out of stock by 1pm. 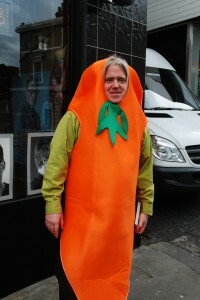 As part of promoting the event, CPTT’s Joe Duggan even rather gamely dressed up as carrot. He may well not thank us for it, but here is a photo of him in his carrot-suit (see right). An impassioned documentary about how the sense of unity which buoyed Britain during the war years carried through to create a vision of a fairer, united society. The film seems of enormous relevance to the Transition movement as we endeavour to rebuild community spirit in the face of the challenges of climate change and energy volatility. 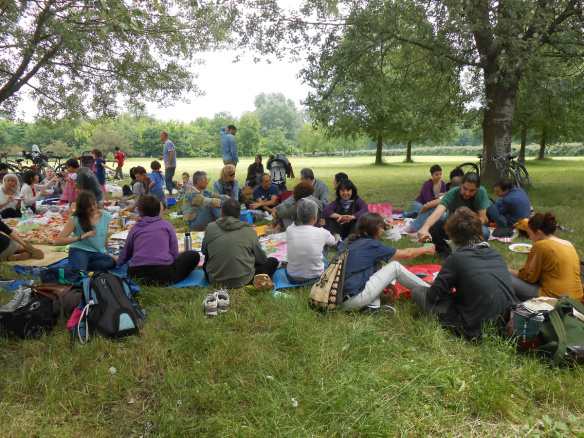 With Spring turning to summer, and things finally starting to warm up after the coldest Spring for 50 years, London Transition groups are out doing some gardening. 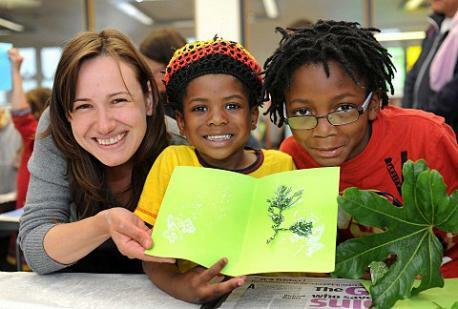 Transition Brockley have been similarly engaged, tweeting “the sun is out, come and garden at Brockley Common from 10-12″. Croydon Transition tweeted that “Thornton Heath Rec Community Garden is really coming along. Put in lettuces, peas, cosmos, sunflowers and a few squashes on Sunday”. Transition Kensal to Kilburn have been back out working on their ‘community allotment’ on Kilburn Tube station, and tweeted “come and see the beautiful black tulips and the blossoming apple tree”. The group also held an event to launch their ‘Edible High Road’ project where they decorated and delivered trees to participating shops. There are some great photos of the event here. 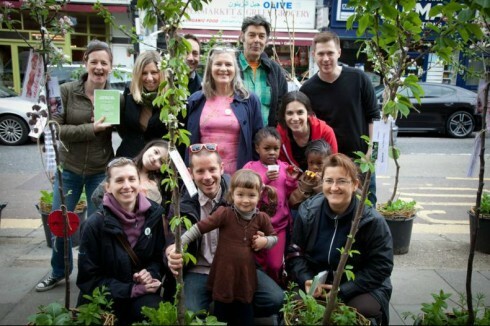 Here is the group with some of their trees, on Kilburn High Road. Between you and me, I don’t know if we’re going to solve the world’s problems. [But] the underlying ethos is that the process needs to be fun enough to be worth doing anyway. I love that about it. There’s a bit of anarchy, which is wonderful. People who are attracted to it tend to be upbeat, optimistic, joyous people. Transition is like when you’re a kid with your friends and you decide to make a circus. 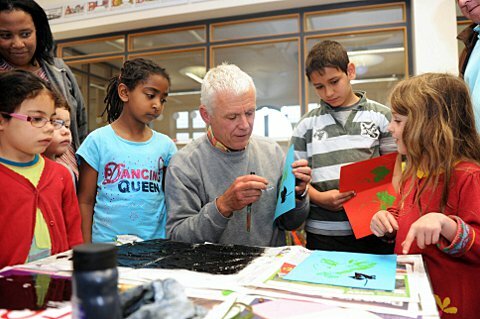 The energy level is so exciting and inviting that more kids want to join you! T-Marbletown (IL) have been busy organising two events, one a classic community pot luck aimed at community building and the other a 5 day retreat which held Transition training events, a regional mid-Atlantic Transition Hub meeting plus plenty of sessions in which members of the public could drop in on. ‘What is *Country X* doing to take care of their environment’? asks TT-Payson (AZ) who start their series with India and Australia. TT-Charlotte (VT) plant out their second annual TT Garden ready for the summer reading bee tepee programme. TT-Viroqua (WI) met to talk about the many benefits of an edible weed garden. Transition Falls Church (VI) continues to grow strong writes Ronald Lapitan, a high school student and key member of the group who first heard of the Transition movement via the film Economics of Happiness and was inspired to start a project. 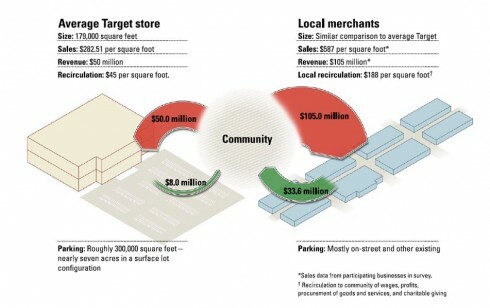 Read his full piece in the Falls Church news press. I have no idea where this video comes from other than assuming it is somewhere in the US, but it features various Transition folks helping someone dig over her garden, while the narrator points out that in 47 days time she’ll be eating greens from her garden. Emily Zionts, a global issues teacher at Woolman, a non-profit educational community in the Sierra Nevada foothills in California, focuses the end of semester on Transition which forms part of their activist toolkit workshops. Joe’s garage seems to be a regular haunt for TT-Comox Valley meetings where they met recently to discuss long term strategic aims and greater collaboration with like minded organisations in the valley. The co-founder of T-Oakville (ON) gave a talk about the Transition model in Cobourg (ON). A public meeting followed shortly afterwards to discuss whether the local environmental group Sustainable Cobourg should become a Transition Town. Read more here and here. 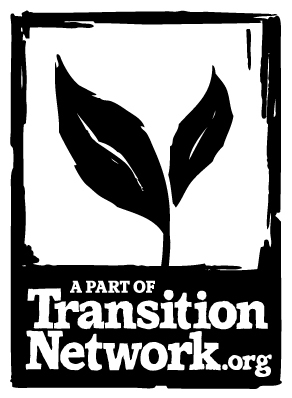 Transition Toronto recently ran a Container & Backyard Gardening Workshop. The idea came from “Not far from the tree” project, could try with Fruitcatcher Fruitgrabber or something more fun that give the idea. In Italy you have “Fruttivendoli” shops who sells Fruits and Veg (the true name with which they played) and you have “Fruttiprendoli”, people who grab or catch fruit or … I don’t know other words”. So we might have a stab at Fruit Tree Harvest (like Transition Cambridge’s project described above) or Fruit Gleaning, or something. Looks like they all had a great time anyway. 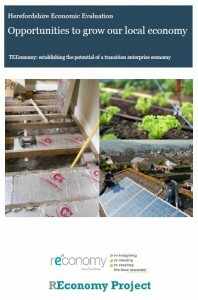 From Japan there’s this great article from the website DE, ‘Transition Towns’ lead the way in low carbon living, which pointed out that “followers believe that it’s communities – and not governments – that drive societal change to adapt to climate change and cut reliance on oil”. Thanks everyone who sent in stories, do send in anything you’d like in the next one. Happy Transitioning!